I applaud you - I love florentines, but I've never been brave enough to make them. Perhaps I need to give this version a try. I think I'd definitely be drizzling with the chocolate at the end, because ... well, just because that's the kind of girl that I am. Love your addition of the orange blossom water. 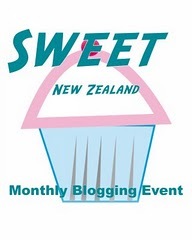 Thanks for sharing at both IHCC and at Sweet New Zealand. I think these are a much easier version, my efforts at the really thing not quite there yet...but I do like a challenge! Your florentines looks great! I have always wanted to make them but somehow have never got round to it! I'm glad these turned out wonderful! A lovely sweet pick of YO's! Your florentines look lovely and the flavour combination, especially with the added touch of the exotic, sounds delicious. Thanks Zosia, light & nutty & just a little bit exotic, perfect with a cuppa. I'm full of all sorts of oh's and ah's over here ;) These look incredibly moreish and very lovely! Just imagining their crispy nuttiness and wonderful orange aroma. Beautiful! I've actually never made florentines but I have eaten my fair share and they are one of my favorite cookies. The orange blossom must add such wonderful flavor!